Most our customers have the demands that not only recover their lost iPhone contacts, but also transfer them back to their device. Recover Contacts back to device could allow users to access their lost or deleted Contacts directly on their iPhone. But in the previous version of iFonebox for Mac, it only supports to recover data on Mac. Now, the updated version of iFonebox for Mac added the function to transfer recovered Contacts back to iPhone directly. Before transfer these deleted Contacts to iPhone, customers could do some edit on the Contacts like change the name, add address, save birthday, etc. 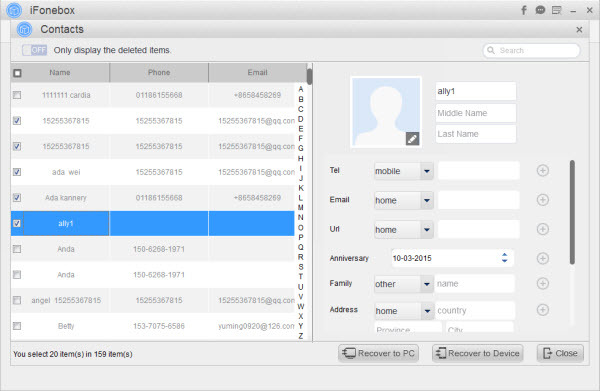 Below we will take a look at how to recover and transfer lost Contacts back to iPhone on Mac. Tip: If you are an iPad users, iFonebox is able to recover and sync lost Contacts to iPad. Install iFonebox for Mac on your Mac and launch it. Then connect iPhone with Mac with USB cable and your device will be detected by the software automatically. Just choose: “Recover from iOS Device” as recovery mode. Then iFonebox for Mac will automatically start scanning and analysis your iPhone. Then scanning time depends on the database in your iPhone. Wait patiently if there is a large data in your iPhone. When the scanning is finished, all the data in your iPhone will be displayed in the interface of the software in categories. Click “Contacts” to preview all the Contacts in your iPhone. Click “Only display the deleted items” to display these deleted. Then choose “Transfer all selected to device” button on the bottom of the interface and just a few seconds, all of the Contacts will be synced to iPhone directly. Tip: If you want to edit the Contacts before transfer them back to iPhone, just choose one Contacts and click the “Edit” button on the right bottom. Then an edit window will pop up and could edit the contents like name, tell, e-mail, address, birthday, etc.